Source of Benzene: Benzene is a volatile, clear, liquid used as a gasoline octane booster and in the manufacture of consumer products such as paint, insecticides and cosmetics. 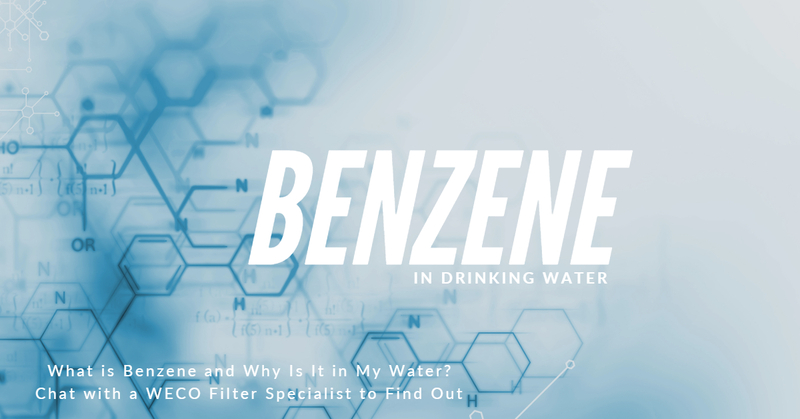 Benzene can get into drinking water from industrial discharge, gas storage tank leaching and landfills. The most common situation is well water contamination with gasoline from leaking underground storage tanks. Wells are often contaminated with benzene from hazardous wastes. US EPA national primary drinking water regulations has set a non-enforcable maximum contaminant level goal (MCLG) for benzene at zero parts per billion and a legally enforced maximum contaminant level (MCL) at 5 ppb (parts per billion or µg/Liter) or 0.005 mg/Liter. US Federal drinking water surveys reported that approximately 1.3% of all groundwater systems contained benzene at levels above the EPA MCL with the highest concentration level reported being 80 µg/Liter. How to Remove Benzene: The Best Available Technology (BAT) for removal of benzene in water is activated carbon filtration. A WECO CCMG whole house filter with granular activated carbon will supply every sink and shower with benzene-free water. Unlike when used for chlorine adsorption from city water, when treating for benzene, activated carbon media in the CCMG backwash filter must be replaced when exhausted. Benzene treatment requires longer contact times with carbon ( >10 min). Chat with one of our WQA certified water specialists for more information. 1. “Background Document for Development of WHO Guidelines for Drinking-Water Quality.” Benzene in Drinking-Water, World Health Organization, 1996, www.who.int. 2. “Common Residential Water Ailments and Remedies.” ANAN Knowledge Base Administration, Water Quality Association, wqa.org. 3. “Ground Water and Drinking Water.” National Primary Drinking Water Regulations, www.epa.gov.